The transverse mesocolon inserts in relation to the taenia mesocolica, and correlative studies have established that the preferential spread of pancreatic lesions along this mesentery is to the inferior border of the transverse colon41,42 (Figs. 4-42 through 4-45). The haustral pattern on the uninvolved, pliable superior border may be thrown into a pseudosaccular appearance. 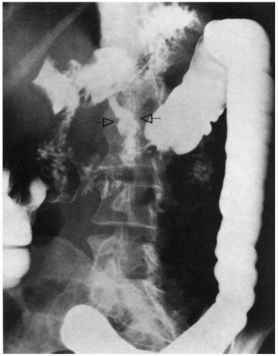 Circumferential growth may develop, although usually the degree of invasion and fixation is not as extensive as may occur from indurated carcinoma of the stomach. 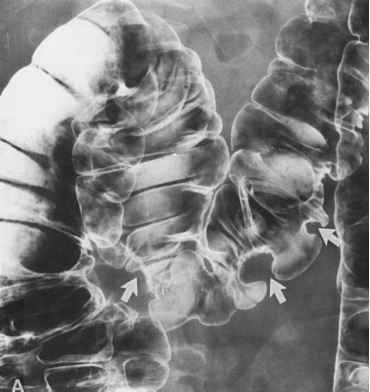 Nevertheless, the greater involvement of the posteroin-ferior margin of the transverse colon on a barium enema study generally indicates the pancreas as the primary site. Rarely, similar changes may be encountered from seeded metastases on the greater omentum58 (Fig. 4-46). On CT, the transverse mesocolon is identified as the fatty plane extending from the pancreas, particularly at the level of the uncinate process, to the ventrally situated transverse colon with the middle colic vessels coursing through it (Figs. 4-47 and 4-48). In cases of pancreatic carcinoma, masslike or dendritic spread through the me-socolon can be precisely localized (Figs. 4-49 through 4-51). Fig. 4—39. Gastrocolic fistula secondary to carcinoma of the transverse colon. These same ligaments provide mesenteric planes for direct extension to and from other sites. 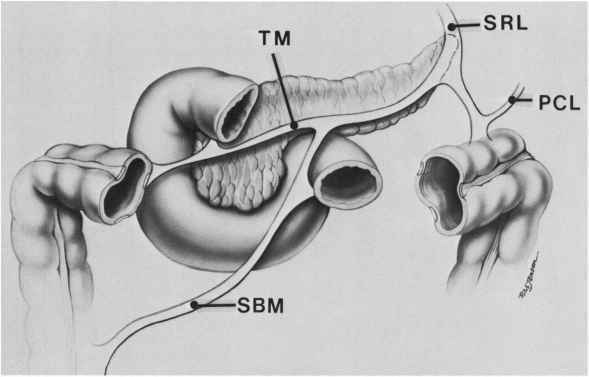 As the hepatic flexure of the colon crosses anterior to the descending duodenum, the two structures are in very close anatomic relationship, separated only by the duodenocolic ligament, constituting the short beginning of the transverse mesocolon6 (Fig. 4-52). In this way, the paraduodenal area may be involved by direct spread from an infiltrating carcinoma of the hepatic flexure across the beginning reflection of the transverse mesocolon6,57,61-63 (Figs. 453 and 4-54). Carcinomas of the right colon are notoriously clinically occult, and the palpation of an epigastric or right upper quadrant mass in such a patient may lead to radiologic investigation being initiated with an upper GI series (Fig. 4-54a). This may be very misleading unless the underlying anatomic relationships are kept in mind and a barium enema study undertaken. Fig. 4-40. Spread of pancreatic carcinoma into the gastrocolic ligament. Fig. 4—41. 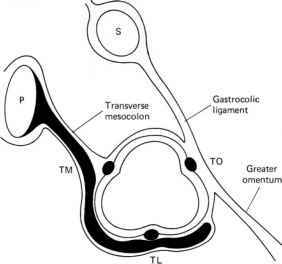 The transverse mesocolon: anatomic relationships and planes of spread. 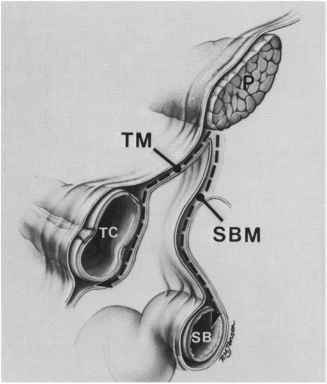 (a) Frontal drawing showing the relationships of the transverse mesocolon (TM) and its continuity with the small bowel mesentery (SBM), the splenorenal ligament (SRL), and the phreni-cocolic ligament (PCL). Fig. 4—42. Sagittal section through the transverse colon. Fig. 4—43. Extension of carcinoma of the pancreas along the transverse mesocolon. 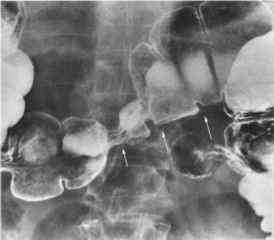 Barium enema documents flattening and fixation along the inferior border of the transverse colon (arrows). Fig. 4—44. Carcinoma of the pancreas with direct invasion of the transverse colon along the mesocolon. 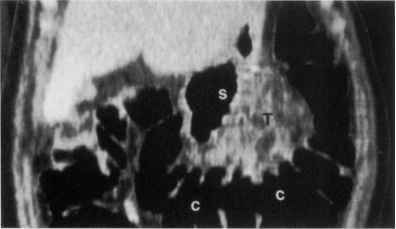 The major extension is typically along the inferior contour (arrows), where multiple nodules are present. Fig. 4—45. Carcinoma of the pancreas extending along the transverse mesocolon. This results in fixation and large mass along the inferior border of the transverse colon. Fig. 4—46. Seeded metastatic ovarian carcinoma on the greater omentum. 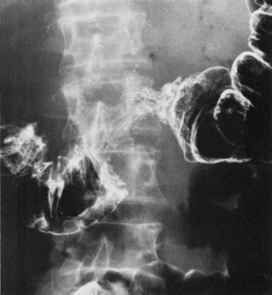 Barium enema shows multinodular infiltration of the inferior border of the transverse colon (arrows). of the duodenum (Fig. 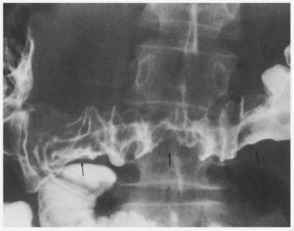 4-55) or upon the lateral aspect of the duodenojejunal junction (Fig. 4-56), it is possible to determine the extent of a colonic carcinoma preop-eratively or the development of lymph node metastases postoperatively.6,64 CT clearly verifies these pathways.63,65 (Figs. 4-57 through 4-60). Rarely, postoperative lymph node metastases may undergo necrosis and become manifest as duodenoduodenal fistulas66 (Figs. 461 and 4-62). How is the duodenocolic ligament formed?